Light balls have become popular Christmas decorations and can often be seen hanging from trees or placed around a yard or garden. While this is a beautiful way to add illumination to outdoor spaces, we feel that light balls have untapped potential and creative possibilities beyond their conventional use. The classic globe shape and sturdy metal frame pre strung with lights is an open invitation for creative embellishments. 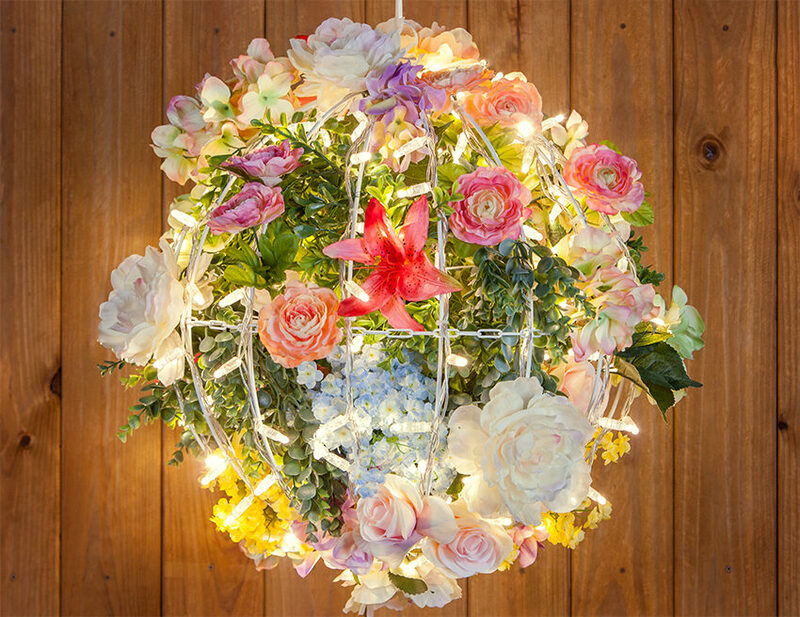 The warmer weather and gardens bursting with colorful flowers gave us an idea, why not create a lighted flower ball? We wanted our spring light ball to reflect the vivid colors, variety of textures and wild beauty found in a cottage garden, so we headed to our local craft store and came up with a diverse bouquet of brightly colored silk flower stems and greenery. 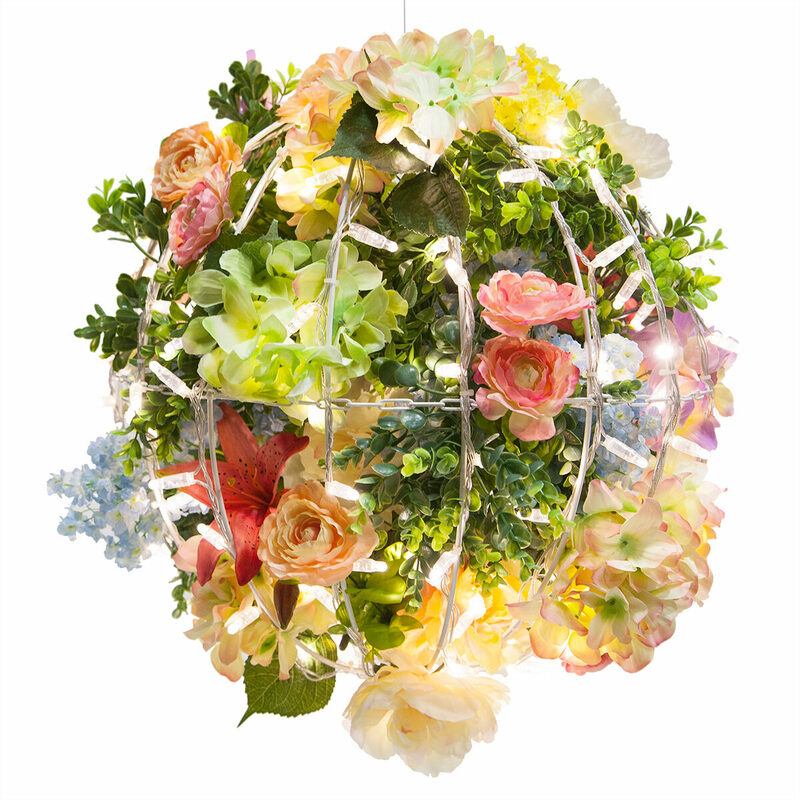 One of our favorite aspects of making a flower ball is its ability to lead two lives: one as a gorgeous decoration during the day and the other as a stylish accent light at night. Another reason we love decorating light balls is the ability to completely customize your colors and accents. You could even change out the flowers during different seasons to keep your design looking fresh! Light Ball - size, frame color & light color of your choice. Our light ball is completely filled with flowers and even has some florals attached to the outsides and spilling out over the frame to keep with our wild cottage theme. 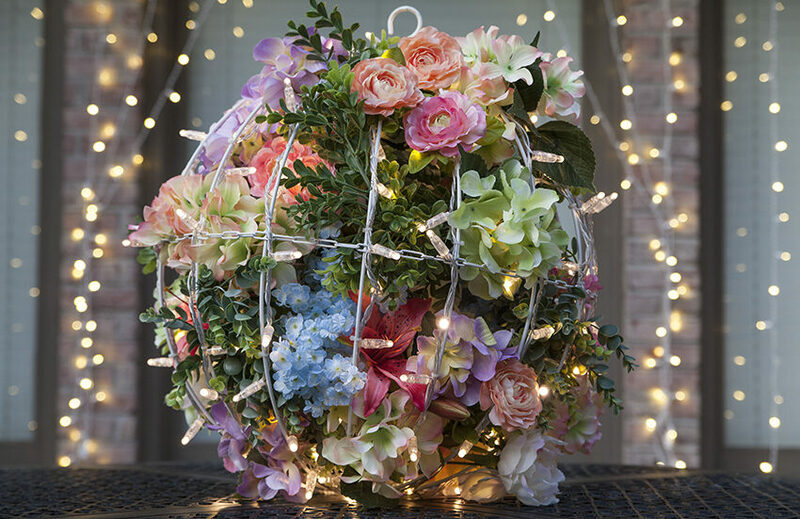 We've placed the steps we took to create this design below, however the method you use to decorate your light ball may vary slightly depending on the type and quantity of flowers and filler you use. For example, if you wanted to see more light shining through the ball, you could skip the filler and attach flowers to the outside frame only, or if you like the look of a pomander ball, you may choose to use all of the same flowers arranged symmetrically to achieve a similar design. First, we attached our greenery garland to the frame of the light ball using floral wire. We chose to use a combination of eucalyptus and boxwood garlands for their rich green color and full appearance. Just the greenery alone created an elegant light display and completely transformed the ball. It looked so pretty we almost decided to stop here! Next, we attached our filler flowers to the inside and outside frames of the ball to fill in the gaps between the greenery. We used pink, purple and green hydrangeas as well as blue and yellow flowering bushes as filler. Tip: When selecting your filler flowers, look for silk flowers that have multiple stems coming off of one bunch and use wire cutters or sharp scissors to separate the individual flowers from the main stem. Buying flowers by the bunch instead of the individual stems is typically less expensive and a great option for filler! The ball looked beautiful with just the filler and greenery and we probably could have stopped there, but we felt something was missing. Since we saved money on the filler, we decided to splurge a little on the accent flowers and went for realistic silk stems which are sold in smaller quantities but look incredible. We chose a combination of peach and pink peony stems, ranunculus sprays and tiger lilies and attached these primarily to the outside of the frame using clear zip ties. Zip ties hold tight around the flower stems and frame ensuring that they stay put, however you could use floral wire here if preferred. 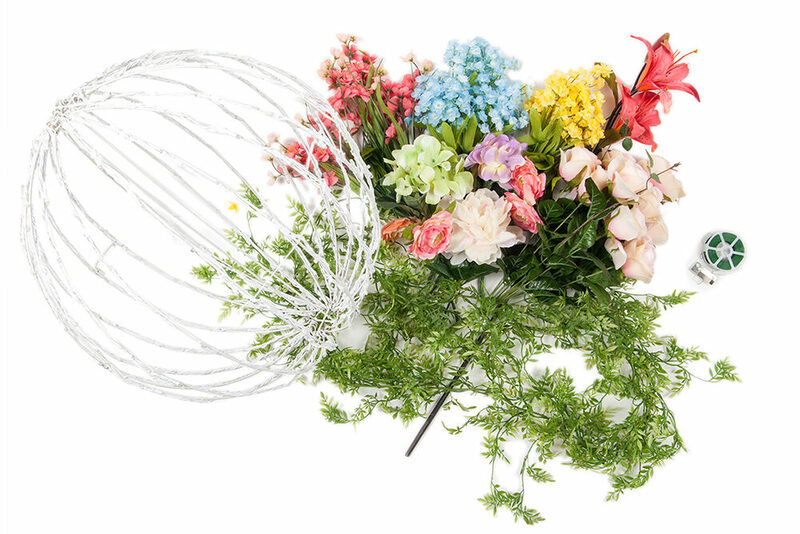 Hanging flower light balls from tree branches, garden archways or hooks on the porch or deck. 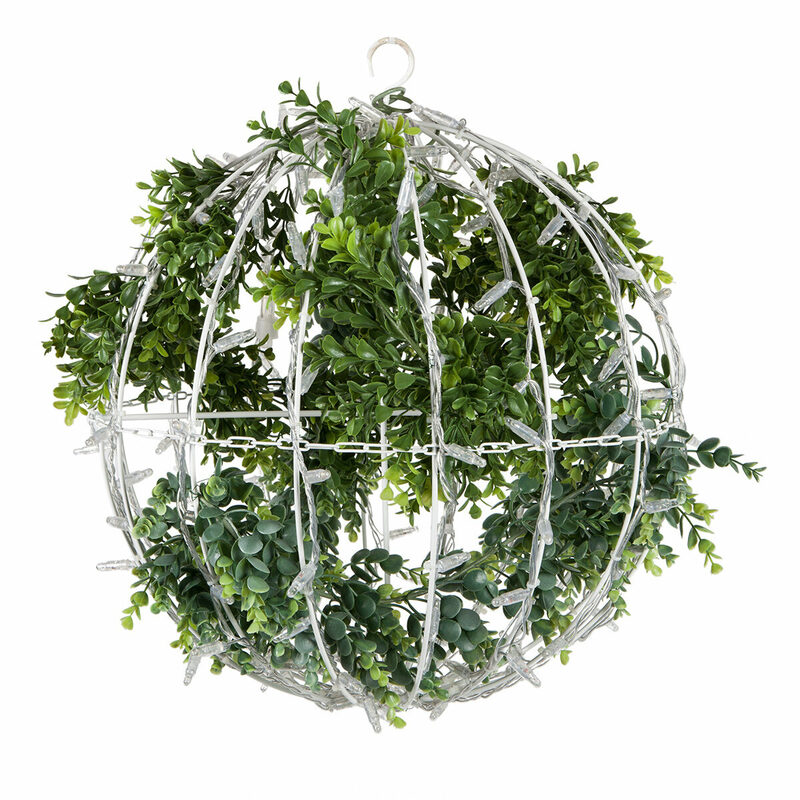 Use light balls as topiary balls along walkways or on each side of the porch. Place light balls at the center of an outdoor dining table as an elegant centerpiece during a wedding or dinner party, or hang a light ball just above each table to create a gorgeous chandelier. There was an error processing your signup!